Gallery of mimic movements and emotions. If emotions of female face are changeable during time then it is necessary to correct facial design according to inconstant changes of physiognomic symbols, but cosmetic make-up is possible for correction according to long emotional expressions, and woman can not pay attention on transient mimic movements. Quiet eyebrows and sad eyes seem glad as the mouth expresses joyful emotions. The joyful mouth and sad eyes seem calm as eyebrows express quiet emotions. The joyful mouth and quiet eyebrows can seem dismal as eyes express sad emotions. Sad eyesight is calm when mind is tranquil or placid, and joyful feelings give pleasure to expression of sad eyes. The person tries to not think about senseless values of pleasant feelings, and cheerless eyesight regrets about unfeasible desires. 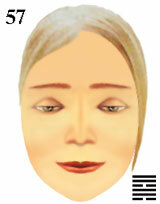 mimic movements of female face and emotions of cosmetic makeup.